Note: You can enter this giveaway three (3) times per e-mail address per day. Deadline is 11:59PM ET 9.28.18. You’ve heard the buzz on the latest kitchen appliance, the Instant Pot, and now it’s here in a smaller version. 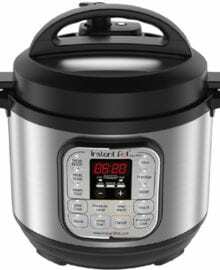 Although it’s smaller in size, the Instant Pot Mini still features all the multi-cooking capabilities of the original version. This 7-in-1 appliance is a rice cooker, pressure cooker, slow cooker, steamer, sauté, yogurt maker and warmer. The smaller size makes it perfect for smaller households wanting to make Pressure Cooker Ribs or Coconut Rice. It’s also great for camping or traveling. The unit features 11 smart programmable controls, has a up to a 24-hour delay start, and will keep food warm up to 10 hours – it really does allow you to cook and eat almost in an instant. NO PURCHASE NECESSARY TO ENTER OR WIN. Void where prohibited by law. Open to legal residents of the 50 U.S., D.C. and Canada (excluding Quebec) who are at least eighteen years old at the time of entry and have internet access. Begins on 8.2.18 at 12:00:00 a.m. ET and ends on 9.28.18 at 11:59:59 p.m. ET. To enter the giveaway, submit your full name and email address on this form. Odds of winning this giveaway depend on the total number of eligible entries received. Only three (3) entries per email address per day. Sponsored by Leite’s Culinaria, Inc. For more information, visit our Official Rules. For a list of winners, check out our Very Happy Winners page. Be sure to add giveaways@leitesculinaria.com to ensure notification if you are the winner.